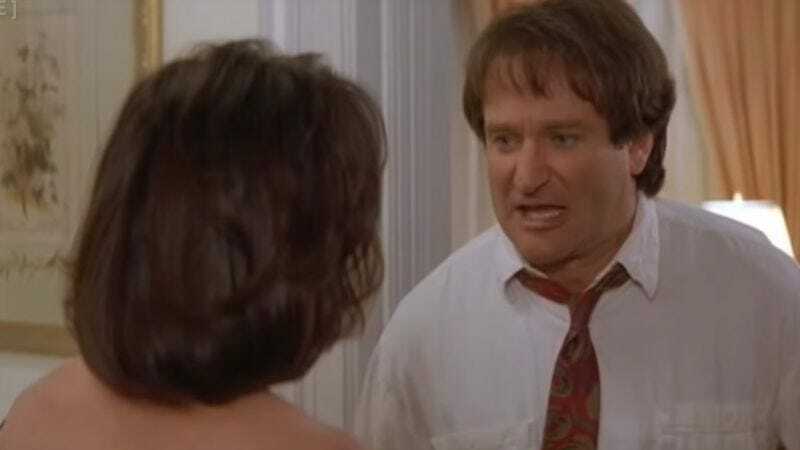 Despite being a high-concept, slapstick-heavy family comedy, 1993’s Mrs. Doubtfire actually deals with some desperately unfunny themes, including the painful dissolution of a marriage, the estrangement of a family, and the panic a parent experiences when faced with the loss of his children. Take away the cross-dressing, the funny voices, and the Oscar-winning makeup, and what remains is the story of a very sad, broken man who goes to extreme lengths simply to spend quality time with his children. That uncomfortable truth is at the core of some deleted Mrs. Doubtfire scenes that were posted to the YouTube account of Matthew Keys. Had these eight extra minutes of footage been included in the final film, Mrs. Doubtfire might have been an emotionally bruising and deeply uncomfortable experience for the film’s young, impressionable audience. The first of the two excised sequences involves a disastrous spelling bee in which young Lydia Hillard (Lisa Jakub) is a contestant. Lydia’s irresponsible but loving father Daniel (Robin Williams) shows up late, finds there are no seats left at the event, and proceeds to get into a public argument with his ex-wife Miranda (Sally Field). Tellingly, there are no jokes here; the scene plays out as tense, mostly whispered drama. The bad vibes continue after the spelling bee is over and the dejected father tearfully apologizes to his eternally disappointed daughter. Having fun yet? This, however, is a mere warm up for the even darker second scene, a brutal argument between the divorced couple, with all three of their children listening in. Again, merriment is in short supply here, as the ex-spouses use their words to wound one another. It ends with the mother, all alone in the foyer of her broken home, hanging her head in sorrow and shame after being renounced by her own offspring. Apparently, someone along the line decided that a featherweight comedy like Mrs. Doubtfire could not support such a scene.